Oops - we don't appear to have a video for the fi-6670A. The Fujitsu fi-6670A is a high-end high-speed real-time image processing function armed duplex ADF scanner that comes loaded with the industry's leading image processing Kofax VirtualReScan (VRS) software and Kofax image processing board. As a result, it supports real-time auto-rotation, auto-colour recognition and other powerful features that enable it to scan at an impressive class leading 90ppm / 180ipm(Note) for ultra-efficient scanning operations. The 90ppm / 180ipm capable (A4, Landscape, 200dpi) fi-6670A and fi-6670 are among the fastest scanners in their class. Their ability to continuously scan 200 sheet mixed batch documents containing paper of different weights, quality and sizes enables both of these scanners to efficiently digitize large volumes of documents. On top of this, the fi-6670A and the fi-6670 are able to scan paper that is up to 3m long, which enables them to digitize electrocardiograms, instrumental data readings and other long documents. The fi-6670A comes loaded with a Kofax CGA board that offers even better image processing functionality and performance. Its ability to create sharper images from stained documents or documents with dark coloured backgrounds with this CGA board guarantees highly efficient scanning. 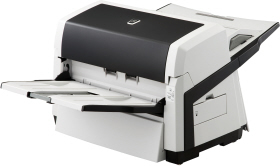 The fi-6670A and the fi-6670 are loaded with 2 high end fi-Series functions that enable them to efficiently scan mixed batch documents containing paper of different weights, quality and sizes. The intelligent multifeed function simplifies pre-scanning preparation and improves efficiency by ignoring documents that tend to trigger false multifeed alerts, such as photo and sticky note attached documents. In addition to being loaded with a function that ensures that trapezoid-shaped documents as well as index tab and sticky note attached documents are scanned in their entirety, the fi-6670A and fi-6670 support a function that removes the circular and angular punch hole representations that are created from scanning loose-leaf sheets, courier service forms and other similar documents. The fi-6670A and the fi-6670's bundled barcode and patchcode reading functionality enables them to separate different jobs with their automatic job separation function. The result is improved digitizing efficiency. ScandAll PRO enables both of these scanners to seamlessly link with Microsoft® Office SharePoint® Server for easy digitized document sharing and viewing administration. The result is even easier document management. Closable operating panels located on the left and right side of the unit permit the scanner to be placed against a wall or in a corner without affecting operability.